A Procession at Ss. Simon and Jude Cathedral to honor Consecrated Life, Religious Sisters, Brothers and Fathers. On Friday evening of February 1st, the Vigil of the Feast of the Presentation, Auxiliary Bishop Eduardo Nevares celebrated a Candlemas for the World Day of Prayer for Consecrated Life to honor the Religious Sisters, Brothers and Priests of the Diocese of Phoenix. Sixty-five Religious Sisters, Brothers and Priests gathered with the lay faithful. The Mass was very well attended with about 200 in the congregation that first gathered outdoors at the foot of the Cross in front of the Cathedral for the Blessing of the Candles. Bishop Eduardo Nevares, assisted by Deacon Tony Smith and the altar servers, blessed the candles that would be lit for the procession into the completely dark Cathedral. Bishop Nevares blesses all the candles before the procession. Franciscan Friars of the Holy Spirit (front pew); Crosier Fathers and Brothers (next pew). Bishop Nevares delivers a beautiful homily with great enthusiasm about Religious Life. Sr. Monica, local superior of the Servants of the Plan of God (Our Lady of Mt. Carmel, Tempe). Sr. Viviana Lopez (right), Sr. Elisa Monroy (center) and Sr. Juana, MCSTNJ (right). Sr. Mary Jordan, OP, Sr. Mary Brigid, OP, Sr. Mary Gertrude, OP and Sr. Regina Ann, OP, (Nashville Dominicans) the new leadership of St. John Paul II Catholic High School in Avondale. The Missionaries of Charity from Our Lady of Fatima Mission Parish in Phoenix offer the gifts. Bishop Nevares extends his blessing to all the Religious (who renewed their vows during Mass). Sr. Mary Claire of the Society of Our Lady of the Trinity is clearly seen in her gray habit. After the glorious Mass, we all gathered for a reception in newly renovated Smith Hall. Religious Sisters of Mercy of Alma, Sr. Mary Angela (center left) and Sr. Mary Katerina (center right) with Sisters of Life, Sr. Mary Loreta, SV (left) and Sr. Bethany Madonna, SV (right). Siervas from Left to Right: Sr. Monica, Sr. Ximena, Sr. Stephanie and Sr. May, SPD serving at Our Lady of Mt. Carmel Parish in Tempe. Sr. Margery, PVMI, Sr. Maria Olivia, SNDdN, Sr. Nancy, SNDdN, Sr. Dympna, IBVM and more. Bishop Nevares and Fr. Thomas Enneking, OSC, Provincial of the Crosier Fathers and Brothers. Bishop Nevares with two Brothers of the Franciscan Friars of the Holy Spirit. Fr. Antony Tinker, FHS with East Valley Serrans, Alice and Charles “Chuck” Wold. Sr. Margery Therese, PVMI and Sr. Cabrini, DC are beaming with the love of Jesus. Sr. Meg Walsh, SNDdN wiht Mary Woloschuk and Samantha Deschane. Sr. Colleen Braun, CSA and Sr. Letty Regala, SDS. Louis and his father with his older brothers, Nicholas and Theodore who are altar servers at Ss. Simon and Jude Cathedral. All of us had a wonderful time celebrating Our Lord and Consecrated Life in Phoenix. Bishop Olmted with Sr. Viviana Lopez (left) and her family (parents, 4 Sisters and 1 brother). Sr. Viviana with her Novice Mistress, Madre Marina Coatl, MCSTNJ. Sr. Viviana received a black veil showing that she is “Professed”. Sr. Viviana with her Mother General, Madre Virginia o Madre “Vicki”, MCSTNJ. Sr. Viviana with Bishop Olmsted, Madre Vicki (right), Madre Marina (left), Padre Sergio Fita (far right), Fr. Thaddeus McGuire (2nd row, 2nd from right), Father David Loeffler (behind Bishop Olmsted) and Deacon John Barelli (left). What a joy it was for me attend this celebration of Sr. Viviana’s vocation and vowed life! God bless you! He rewards us a hundredfold! On Sunday, January 20, 2019, in the evening, the Sisters of Notre Dame de Namur celebrated the Solemn Vows of Sr. Sarah Cieplinski, a vocation from Phoenix, while on a visit with her family. The celebration took place at the Crosier’s Priory in South Phoenix. Sr. Sarah made her Final Profession of Vows at their Convent in Cincinnati, Ohio. Photo of Sr. Sarah Final Profession of Vows in St. Julie’s Chapel in Cincinnati, Ohio. Sr. Sarah’s Renewal of Vows here in Phoenix on January 20. The Sisters of Notre Dame de Namur in Phoenix – Sr. Sarah (center), Sr. Meg Walsh (left), Sr. Margaret Campbell (right), Sister Nancy W. (2nd from the left) and Sr. Carmen Silva (far left). God bless you, Sr. Sarah and all the Sisters of Notre Dame de Namur! Thank you! 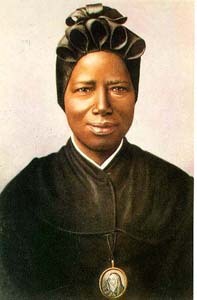 Happy Feast of St. Josephine Bakhita, a Sudanese woman who was a slave, a trafficked woman and virgin who gained her freedom consecrating herself to Our Lord. Her story inspires us all as we follow Christ with lamps lit giving great hope in this dark world. An Italian official, Callisto Legnani, purchased Bakhita. For the first time since she had been kidnapped, she was treated with care, rather than being beaten. When the time came for the Italian consul to return to Italy, he brought Bakhita with him. Once there, Legnani left Bakhita with Augusto Michieli and his wife. When the Michieli’s daughter, Mimmina, was born, Bakhita became her caretaker and friend. May this merciful virgin Saint teach us to forgive and be compassionate! ¡Feliz Navidad, Prospero Año y Felicidad! I want to wish you a Merry Christmas! As we celebrate the birth of Our Savior, Jesus Christ, I want to wish all of you a blessed Christmas Season and New Year, may your hearts be filled with joy, peace and love! This time of year is one in which the light of Christ illumines brightly giving us wisdom. “Among all human pursuits, the pursuit of wisdom is more perfect, more noble, more useful, and more full of joy. It is more perfect because, in so far as a person gives himself to the pursuit of wisdom, so far does he even now have some share in true beatitude. And so a wise man has said, Blessed is the man that shall continue in wisdom (Sir 14:20). It is more noble because through this pursuit man especially approaches to a likeness to God who made all things in wisdom (Ps 104:24). And since likeness is the cause of love, the pursuit of wisdom especially joins man to God in friendship. This why it is said of wisdom that she is an infinite treasure to people which they that use become the friends of God (Wis 7:14). It is more useful because through wisdom we arrive at the Kingdom of immortality. For the desire of wisdom bringeth to the everlasting kingdom (Wis 6:21). It is more full of joy because her conversation hath no bitterness, nor her company any tediousness, but joy and gladness (Wis 8:16). ~St. Thomas Aquinas (+ 1274) was a Dominican Priest from Italy. He remains one of the Church’s premier Doctors. Saturday, December 1, 2018, on the Feast of Blessed Charles de Foucauld – Fr. Eugene Florea, a Diocesan Priest of Phoenix, was Consecrated as the first Diocesan Hermit, and he made First Profession of Vows of Poverty, Chastity and Obedience, committing himself to a Carmelite Rule of life. He received a modified Carmelite habit and a religious name: Fr. Eugene Mary of the Trinity. Here are some photos from his Consecration at Ss. Simon and Jude Cathedral in Phoenix. Fr. Eugene Mary of the Trinity (left), Bishop Thomas Olmsted (center), Dcn. Doug Bogart (right). Thank you, Lord, for the gift of Fr. Eugene Mary of the Trinity! Let us rejoice as we celebrate the Incarnation, God the Father’s gift to us in His Son! Merry Christmas! God bless you. Reasons to Celebrate this new Season! ¡Razones para celebrar esta nueva estación! The Parish Visitors of Mary Immaculate from New York (Sr. Mary Eileen Jewell, PVMI and Sr. Margery Therese Harkin, PVMI) are now serving in adult faith formation, catechesis and evangelization at Our Lady of Joy Parish in Carefree, AZ. The School Sisters of Notre Dame (Sr. Patricia Gehling, SSND and Sr. Ann Marley, SSND) are serving in the Parish Office of Christ the King Parish in Mesa, AZ. The Eucharistic Franciscan Missionary Sisters of Los Angeles are establishing a new foundation and convent at Immaculate Conception Parish in Cottonwood, serving as bilingual Religious educators at Immaculate Conception Parish in Cottonwood, AZ and Saint John Vianney Parish in Sedona, AZ. They are a great blessing for us! On August 21, we had the grand opening and dedication of St. John Paul II Catholic High School in Avondale. The first day was on August 13 with Freshman and Sophomore Classes. Sister Mary Jordan Hoover, OP is the principal accompanied by 3 of her Sisters, serving as the leadership of this wonderful school which is forming our children well. St John Paul II Catholic High School grand opening and blessing on Tuesday, August 21, 2018 in Avondale, Arizona. Bishop Thomas J. Olmsted addresses a large crowd which overflowed. Front: Bishop Eduardo Nevares left of Sr. Mary Jordan Hoover, OP. Behind: Superintendent of Schools, Harry Plummer with Deacon Doug Bogart. Third row: Dr. Maria Chavira, Chancellor of the Diocese, and Fr. Fred Adamson, V.G. There were many people who came to be part of this grand opening and dedication. Father Fernando Camou, the new high school chaplain. Bishop Thomas Olmsted blesses the new school building with holy water. Thank you, Bishop Olmsted and all who were involved in making this dream a reality! Have you ever been to the St. Joseph Shrine in Yarnell, AZ? Why not go sometime? The Stations of the Cross are the highlight. The weekend of September 7-9, we celebrated the 85th Anniversary of the Sisters of Charity of Seton Hill in Arizona, beginning in Tucson and thriving in Phoenix, AZ. On Friday evening, I joined the celebration at Our Lady of Perpetual Help in Scottsdale, AZ. Sister Mary Elizabeth Lawrence, SC was playing the steel drums. Hearing her play reminded me of the music of the Caribbean Islands. Representation of the Sisters of Charity of Seton Hill from Greensburg, PA. Recently, I made a trip to Our Lady of the Rosary Dominican Convent in San Jose, CA. They have beautiful stained glass windows in their chapel of Dominican Saints as well as a small shrine to Mary, Mother of God, Mater Dei. The roses there are breathtaking! Ss. Agnes of Montepulciano and Margaret of Hungary, pray for us. As we prepare to celebrate the Feast of Pentecost this Sunday, let us rejoice that the Lord has chosen us to follow Him and be configured to His Son, Jesus Christ. May the Holy Spirit touch all our hearts, purifying us and sanctifying us to become holy. Holy Spirit, come into our hearts and minds, inflame in us the fire of Your Love. On Saturday, May 5, 2018, the West Valley Serra Club hosted a beautiful Religious Appreciation Dinner at the Diocesan Pastoral Center where we honored 22 Sisters celebrating Jubilee Anniversaries from 25 years up to 75 years of Religious Life! Front left to front right: Sr. Gabby Marry, IBVM (60 years), Sr. Sandra DeMann, FSPA (50 years), Sr. Cecilia Warner, SSND (50 years), Sr. Kathleen Janiak, RSM (60 years), Sr. Lillian Lila, BVM (70 years), Sr. Ann Marley, SSND (60 years). Wow! 2nd row left to right: Sr. Betty Banja, SHS (25 years), Sr. Mary Brigid Burnham, OP (25 years), Sr. Mary Gertrude Blankenhagan, OP (25 years), Sr. Mary Jordan Hoover, OP (25 years), Sr. Mary Lynn Heiser, SSND (60 years), Sr. Elizabeth Carey, IBVM (70 years), Sr. Georgene Faust, SDS (75 years). Back, left to right: Sr. Margaret McBride, RSM (50 years), Sr. Maria Olivia Pacheco, SNDdeN (45 years), Sr. Linda Campbell, OSB (50 years). What a blessing you all are for the Diocese! We had a such a lovely time together with the Serrans, our dear, supportive friends! Sr. Georgene Faust, SDS (right) celebrates 75 years of Consecrated Life! Sr. Gabrielle Marry, IBVM celebrates 60 years of Consecrated Life! Sr. Mary Jordan Hoover, OP, Sr. Mary Brigid Burnham, OP and Sr. Mary Gertrude Blankenhagan, OP are classmates, celebrating 25 years since they professed their First Vows. Congratulations, Sisters! Sr. Betty Banja, SHS (left) with Sr. Sophie, her former Postulant mistress. Bishop Eduardo Nevares (right) in conversation with Josefina Camou, mother of Fr. Fernando Camou of St. Thomas Aquinas Parish in Avondale, AZ. Sr. Raphael Quinn, IBVM smiles with delight as she enjoys the evening. Parish Visitors of Mary Immaculate, Sr. Mary Beata and Sr. Margery. Carmelite Sisters of St. Teresa from Kerala, India, left to right: Sr. Nidhi, Sr. Sheena & Sr. Tessy, who teach at St. Mary-Basha School in Chandler. Thursday, May 10, Sr. Rita, SHS and Sr. Rael, SHS, two Council members of the Sisters of the Sacred Heart of Jesus came for visitation from war-torn South Sudan. They were welcomed by Bishop Thomas Olmsted, Fr. Robert Aliunzi and myself. Left to right: Sr. Sophie Lado, SHS (local superior), Fr. Robert Aliunzi, A.J., Sr. Betty Banja, SHS, Sr. Rael, SHS and Sr. Rita, SHS. On Saturday, May 12, there was a special Silver Jubilee Mass at St. James Parish in Glendale for the celebration of Sr. Betty Banja’s 25 Anniversary of Religious Vows and Fr. Benedict’s 25th Anniversary of Priesthood. Bishop Nevares celebrated the Mass, and there were many present for the great celebration Mass and reception. Sr. Betty Banja renewed her vows, Fr. Benedict shared his vocation story and Bishop Olmsted was present for the dinner celebration after Mass. It was glorious! Fr. Benedict, AJ, Sister Betty Banja,SHS and Bishop Eduardo Nevares. Left to right: Fr. Benedict, AJ, Sr. Rael, Sr. Betty, Sr. Rita, and Bishop Nevares. What beautiful celebrations we had to celebrate Consecrated Life here in Phoenix! Happy Mothers Day! As we celebrate motherhood and the Blessed Virgin Mary, we love the tradition of crowning the Queen of Heaven and showering her with roses. This Mothers’ Day coincides with the Solemnity of Our Lord’s Ascension into Heaven and the Feast of Our Lady of Fatima. As our Mother, she intercedes for our sanctity and salvation. Let us approach her with trust and confidence, consoled by her Immaculate Heart. International Statue of Our Lady of Fatima at Our Lady of Mount Carmel Parish in Tempe. Since Easter Sunday, God has blessed me abundantly as a spiritual mother. Sophia Maria Davis, daughter of Carrie Davis, admires the Mercy Cross. On April 2nd, I made a special trip to the Diocese of Gallup, NM to give a retreat to the Sisters of Our Lady of Guadalupe and Saint Joseph (Las Hermanas de Nuestra Señora de Guadalupe y San José) to help them prepare for their first official General Chapter of Elections and Chapter of Affairs. The Holy Spirit directed all the conferences, prayers and proceedings. It was a truly blessed time. God’s magnificent love embraced me in every sunrise and sunset of each day. The beauty and the precious experience I had with the Sisters will always be cherished. What touched me most was that all 9 Sisters called me their madrina or Godmother. Bishop James S. Wall of Gallup with Las Hermanas de Nuestra Señora de Guadalupe y San José & Sr. René Backe, CSA (right). We enjoyed our meals together each day of the 5-day retreat. We prayed morning and evening prayers (Liturgy of the Hours) together with Eucharistic Adoration during the evening Holy Hour. Perpetual Adoration Chapel of Las Hermanas at Casa Reina Convent. Front of Casa Reina, the new Convent of Las Hermanas. Three parakeets greeted me as I entered the Convent, Casa Reina. The sunset over Sacred Heart Retreat Center in Gallup, NM. Mini, a very affectionate cat, became my friend. The Hermitage at Sacred Heart Retreat Center in Gallup. Main Chapel of Sacred Heart Retreat Center in Gallup, NM. It was a time of blessings and communion with Las Hermanas. Blessed Holy Week and Happy Easter! Blessed Holy Week! From March 9-11, we had the Spring Convocation for Religious at the Franciscan Renewal Center with the theme of “Mercy, Forgiveness and Healing” featuring Fr. Ignatius Mazanowski, FHS and Sr. Esther Mary Nickel, RSM as speakers. It was a blessed time of prayer and retreat as we had Eucharistic Adoration throughout the weekend coinciding with Pope Francis’ call for “24 Hours for the Lord” of continuous Eucharistic Adoration and the Sacrament of Confession. It was a prayerful weekend with the blessing of Mass with Bishop Olmsted accompanied by Deacons and wives who were on a formation retreat that weekend. The group of Sisters that attended took this opportunity to make a spiritual retreat. Communities in this photo: Sisters of Loreto, Sisters of the Divine Savior, Carmelite Sisters of St. Teresa, Missionary Carmelites of St. Therese of the Child Jesus, Dominican Sisters of Mary, Mother of the Eucharist, Lovers of the Holy Cross of Saigon, Sisters of the Sacred Heart, Servants of the Plan of God, Congregation of St. Agnes, and Religious Sisters of Mercy of Alma, MI. What a great group we had! Others included, the Society of Our Lady of the Trinity, the Consolata Missionaries, the Daughters of Charity and Sr. John Mary, ESEH. Both talks were marvelous! Sister Esther Mary gave a wonderful talk from a Sacramental theological perspective on mercy, forgiveness and healing of Penance. Father Ignatius spoke about the process of forgiveness which is the beginning of the process of the healing of the heart. We had wonderful weather throughout the weekend, and it even rained! Sr. Anthony Mary Diago (left) and Sr. Esther Mary Nickel (right). The Word became flesh in MARY and dwelt amongst us. There is a new Sister who came to the Convocation who I would like you to meet: Sister Isabel de la Santísima Trinidad a novice of the Missionary Carmelites of St. Therese of the Child Jesus from Puebla in Mexico. On November 21, 2017, on the Feast of the Presentation of Mary, I attended her entrance into the Novitiate at the Holy Sacrifice of the Mass in which she was invested in the Carmelite habit of her Religious Community at St. Daniel the Prophet Parish in Scottsdale. Bishop Olmsted, Fr. McGuire, the Pastor, Fr. Loeffler and Fr. Fita were present to witness the investiture of Sr. Isabel by her Mother General. Sr. Isabel de la Santísima Trinidad Hernandez with her Mother General, Madre Virginia. “I am very grateful with God and St Therese of the Child Jesus because by her intercession she has helped me to recognize my vocation and pursue religious life. God has granted me many blessings one of them was getting the opportunity to know the sisters. I met the sisters at Saint Anne’s Parish in Gilbert, AZ in 2012, it was through them that I began to wonder what it was like to live like them. Who knew that God had already chosen me to follow Him? In December of 2016, I had the opportunity to go to Puebla, MX for an experience. Seeing so many young sisters willing to give their life to God, affirmed my willingness to be part of this religious life. I received the habit in the congregation of Carmelite Missionaries St Therese of the Child Jesus on November 21st of 2017. The memorable mass was celebrated by Bishop Thomas J. Olmsted and Rev. McGuire, Rev. Loeffler, Rev. Lorig, and Rev. Sergio as the co-celebrants. It was very exciting as well as nerve-wracking because I was taking a much bigger step. There were a lot of things that were scaring me because I was taking a decision that would change my life. Interiorly, I was afraid of what my family members and friends would think, but once I was in mass, seeing Jesus on the cross I realized that if Jesus had died for me. Why not me give my life to him? “Estoy muy agradecida con Dios quien por gracia me ha llamado y Sta. Teresa del Niño Jesús, porque por su intercesión me han ayudado a reconocer mi vocación y seguir al Señor en la vida religiosa. Dios me ha concedido muchas bendiciones a lo largo de mi vida una de ellas fue el tener la oportunidad de conocer a las hermanas. Conocí a las hermanas Misioneras Carmelita de Santa Teresa del Niño Jesús en la parroquia de Santa Ana en Gilbert, AZ el 2012, fue a través de ellas que me empecé a preguntar qué era vivir como ellas. ¿Quién se imaginaba que Dios ya me había elegido para seguirle? En diciembre de 2016, tuve la oportunidad de ir a Puebla, Mex., para hacer una experiencia y conocerlas mejor. El ver tantas hermanas jóvenes dispuestas a dar su vida a Dios, afirmó mi vocación y el deseo de abrazar la vida religiosa. Regrese a la Diócesis de Phoenix para continuar mi vocación, recibi el Hábito en la Congregación de Misioneras Carmelita de Santa Teresa del Niño Jesús el 21 de noviembre de 2017. La memorable Misa fue celebrada por el Obispo Thomas J. Olmstead y concelebrantes los Reverendos Padres McGuire, Loeffler, Lorig y Sergio Fita. La misa fue muy emocionante y estresante a la vez, porque estaba dando un paso más. Había muchas cosas que me estaban asustando porque estaba tomando una decisión que sabia que iba a cambiar mi vida. Interiormente, tenía miedo de lo que podrían pensar mis familiares y amigos. Pero una vez estando en la Misa y viendo a Jesús en la cruz. Me pregunté ¿Por qué no me darle mi vida a él? Ahora llevo ya dos meses de novicia, y puedo asegurar que no siempre ha sido fácil vivir en la comunidad con las hermanas, pero puedo decir también que ha valido la pena. Me alegro de que Dios haya puesto en mí la curiosidad de querer saber más de cómo es la vida religiosa. Aunque al principio no estaba segura de que estaba llamada a ser una hermana religiosa, con la ayuda de Dios, a través de las escrituras puedo ir descubriendo la voluntad de Dios cada día. Reconozco que todavía tengo un largo camino que recorrer en esta peregrinación, deseo continuar siguiendo a Jesús y ayudar a otros a encontrar la felicidad al igual que yo lo voy logrando continuamente. Thank you, Sr. Isabel. It is a special gift that you shared your entrance into Novitiate. Muchas gracias, Hermana Isabel. Que Dios la bendiga. God bless you. As we take time to listen to the Lord in His Passion and suffering this Holy Triduum, let us rejoice in His victory over death for our salvation and citizenship in Heaven! Blessed Holy Triduum and Happy Easter!